My favorite scene in “Planes, Trains and Automobiles” is when Steve Martin finally blows his stack at John Candy’s irritating character. The thing that finally sends Martin over the edge isn’t when he finds he’s washed his face with Candy’s dirty underwear. It isn’t even when he wakes up to discover that he and Candy are snuggling together in the hotel room’s only bed. I often think of that line when I’m writing and editing. “Here’s an idea: Have a point!” Every piece you write needs a point. It needs a tight story angle. It needs focus. Why is selection, or finding your focus, the best way to condense your copy? Because the best pieces are an inch wide and a mile deep: They cover a small topic, but they do so fully and colorfully. That’s why Jon Ziomek, associate professor at the Medill School of Journalism, keeps a one-inch picture frame at his computer. It’s a reminder to tighten his story angle. I was reminded of the importance of starting with a tight story angle recently when the editor of an airline magazine asked me to write a piece about Kansas City. Well, I know Kansas City. I lived there for 30 years, and I covered it from my desk as a magazine editor for nearly five. But I’ve never toiled so hard on a simple piece. And I’ve never been so disappointed in the results. Might as well ask me to write 900 words on traveling to the United States. My problem, of course, was that my copy lacked focus. And a lack of focus makes it difficult for you — and for your reader — to get through your story. 1. Focus on a single idea. You can communicate one idea well, a handful poorly or several not at all. Think of your piece as a tree. Your story angle is the trunk. The tree can branch out in several directions. But when you find a sapling, yank it out. Don’t tie a rope from the sapling to your tree and call it a branch. Your summary sentence will keep you from getting scattered and from including information that isn’t pertinent to the copy. 4. Test for focus. Finally, make sure every paragraph, every sentence and every word in your piece work together to support your theme. Focus has more to do with what you eliminate from your piece than with what you leave in it. So if a section, paragraph or sentence doesn’t pass the test, take it out. Tighten your angle after you write. Tightening your story angle upfront should help you write short. But if you write a piece that’s too long, you may need to narrow your story again after you write. When New Yorker writer Cynthia Gorney wrote a feature about knees, for instance, her notes filled 13 notebooks, and her first draft was 8,000 words long. “A piece about knees is not a story,” she realized. Her real topic was baby boomer jock knees. And out went 4,000 words. 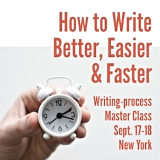 “It’s easier to whack an entire paragraph than a single word,” writes Chip Scanlan, The Poynter Institute’s writing workshop director. So cut sections, not syllables.